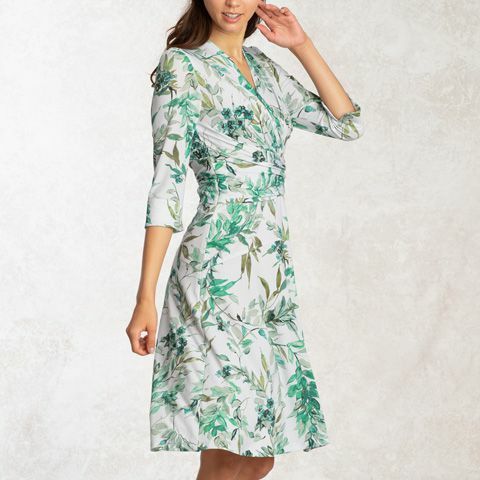 Swing your way into evening events and beyond with our classic cache-coeur dress in pretty green-toned original floral print, with three-quarter sleeves and an A-line skirt. Pair with kay me's Japan-made jackets and knitwear for elegance every day. Our top-quality fabric blend is crease-resistant, soft and stretchy for all-day comfort. A kay me classic, our cache-coeur dresses feature fitted tops with flared feminine skirts and a waist-emphasising built-in belt. Handmade in Tokyo by our team of skilled artisans, each dress is individually sewn and checked to the highest standards.